A short summary of The Cosmopolitan of Las Vegas: a great hotel as long as you stay in an upgraded room. 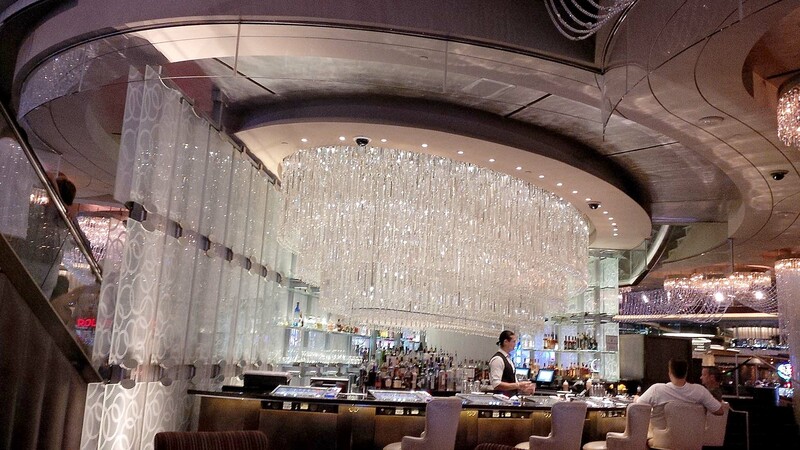 The Cosmopolitan of Las Vegas hotel is modern, well situated, and has delicious dining options. The standard rooms (City Rooms) are mediocre, but Terrace Studios are just an upgrade or two away and they are quite nice. We reserved a City Room, but were disappointed to find that it was very dirty; it seemed like the floors weren’t vacuumed and the room wasn’t dusted. The staff was very accommodating when we mentioned the state of the room, and they assisted us in upgrading to a Terrace Studio with Fountain View. The room was very spacious: nice marble-tiled bathroom with jacuzzi and separate shower, kitchenette with microwave (although strangely there were no plates or silverware! ), living area with a wraparound sofa, and king size bed. We were surprised that neither the City Room nor the Terrace Studio had a chest of drawers, which is an odd decorating choice. The room felt very spacious and even had two TVs. One convenience that I thought was a nice touch: Good morning and Good night buttons next to the bed that turned all the lights in the room on or off (there’s also another pair near the room entrance). You can see the walk-around tour in the video I took (see above). The room had an oversized balcony with comfy seating and a direct view of the Bellagio fountain. It also have a great view of the Vegas strip. An interesting note: from what we could tell, the rooms at the main Bellagio tower did not have balconies from which to watch the water show in the fountains. The shows start at 3 pm and continue into the night. The Bellagio Fountains run every 30 minutes during the day, and 15 minutes at night. However, despite how frequently the shows ran, we kept missing them and only caught the endings over the first couple of days. Eventually we decided to spend some time relaxing on the balcony and got to enjoy it a few times. I’ve posted three videos: one at night, one close up at night, and one during the day. My favorite is the closeup. Although we didn’t partake in any fine dining during our stay, the food at the casual hotel restaurants is great. Holstein’s and China Poblano both have tasty food without any pretension, and the portions were definitely filling. The buffet, however, left us with mixed feelings because it was on the pricey side (when we visited, dinner started at $38 per person). If you are simply going for quantity, then you should give the buffet a go: broad selection and good service. However, we’re not the biggest eaters and we found that the food itself was on the mediocre side despite the huge selection. There are three pools at the hotel (not including the super exclusive VIP pools) and we visited two of them. The Marquee Day Club is reserved for Cosmopolitan guests on the weekend, but open to the public during the week. It has a great atmosphere, but is very expensive if you want to lay in any of the seating areas (it will set you back around $1,000). It was busy, but not too busy. Children are not allowed and the crowd was around late twenties. There are also private cabanas that each have a small private pool with transparent glass walls. If you are lucky, the day you go may have a celebrity guest DJ. We also went to the pool on the 14th floor. This pool is less fancy than the Day Club and allows children. The crowd there was diverse in its age range. The pool area is much bigger than the Day Spa and is definitely worth a visit to do some tanning. The pool was busy but not too busy when we were there. I definitely recommend spending time at both of these pools. The Fountain View Terrace Studio rooms cost about the same as standard rooms at the Bellagio, and less than rooms at the Encore or Wynn. Dollar for dollar, it’s a toss up between the Cosmopolitan and the Bellagio. Our favorite hotels in Vegas are still Encore and Wynn, but those can be a lot more pricey and they are on the far end of the Strip which makes them less convenient. The City Rooms will save you a bit of money but they aren’t nearly as nice as the Terrace Studios with Fountain View. The casino decor is modern and tasteful. It is on par with some of the nicer properties like the Bellagio and the Wynn, and nicer than Caesars Palace (but not nearly as big). To tell you the truth, the convenient location of the hotel led us to spend more time in the shops than at the casino. The Cosmopolitan is a nice modern hotel with good dining and great location. However, even though our upgraded room was great, our first room was not cleaned well and was not up to par. I would most likely stay in a Terrace Studio if I went there again, or try the Bellagio which is next door.